Speaking to a Brussels audience yesterday evening (6 April), Oettinger insisted the upcoming copyright proposal should slide through political negotiations quickly—within a year and a half—and without being “blocked” for years in “tedious” talks with the European Parliament and member states. But the tech industry, online news publishers and MEPs are still caught up in a heated fight with the Commission over the so-called Google tax, or ancillary copyright law. The Commission delayed its proposal by opening a new public consultation last month that asks for feedback on copyright law for online news publishers, one of the ideas that has drawn the most criticism. 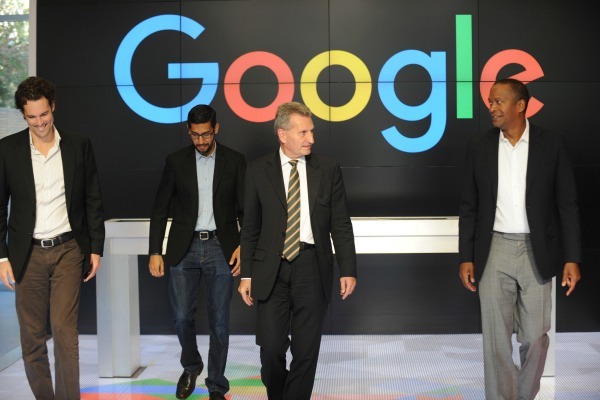 Oettinger said yesterday that he is “open” to an EU-wide ancillary copyright law that would allow news publishers to charge internet search engines for showing their content in search results. “Newspaper publishers claim there’s a need for action,” he said. Opponents to an EU-wide ancillary copyright law say previous attempts aimed at charging search engines have flopped. Oettinger named national laws in Germany and Spain as possible models for an upcoming EU-wide copyright regulation of online search engines. Last year, Oettinger told MEPs the Spanish copyright law was the more successful of the two. Google News stopped operating in Spain after a copyright law came into effect there in 2014. A group of German publishers, including giant Axel Springer Verlag, have been embroiled in a legal battle with Google since the company refused to pay for showing snippets of news articles in search results. EU Digital Commissioner Günther Oettinger said that he prefers Spain’s controversial ancillary copyright law on Tuesday (14 July), sometimes nicknamed a ‘Google tax’, to the German model. Politicians in favour of ancillary copyright law argue the fees drawn from search engines could pump life into media companies grappling with financial losses. 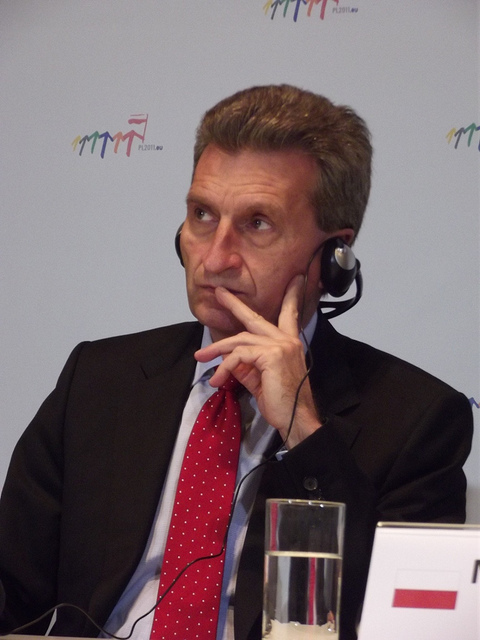 “It has to be clear that we can’t stabilise every publisher’s business,” Oettinger said. “We can’t guarantee profits for the individual,” he added. In a discussion following Oettinger’s talk, German EPP MEP Sabine Verheyen (CDU) argued that regulation is needed to “balance out the loss in the journalism sector”. “We need adequate remuneration for the work that’s done in journalism. Whether that’s an ancillary copyright law or a user fee or a search fee,” she said. 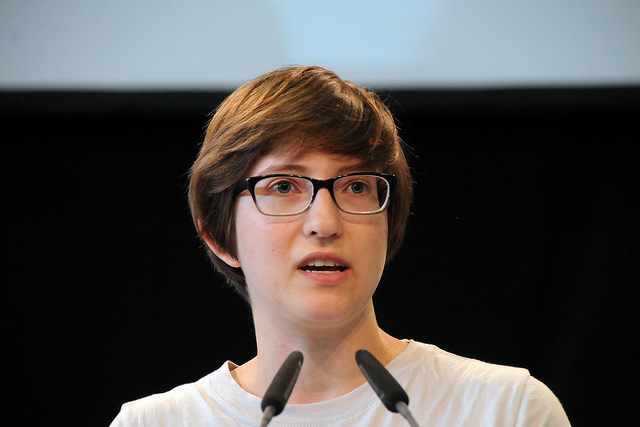 Another German MEP from Verheyen’s EPP group, Angelika Niebler (CSU), called for a similar measure to finance media companies in an amendment she submitted to the Parliament copyright report passed last summer. MEPs voted against Niebler’s amendment. German and Spanish news editors who opposed the ancillary copyright legislation in their own countries warned yesterday against modelling a new EU-wide proposal on those laws. Speaking in response to Verheyen, Jochen Wegner, editor of Zeit Online, said, “I want to convince you not to worry too much about how we earn money”. Zeit Online is the website of German weekly newspaper Die Zeit. Wegner called the German ancillary copyright law “totally broken” and a way to “extort a little money out of Google”. Ignacio Escolar, director of Spanish news website eldiario.es, was equally critical of the Spanish law that shut down Google News. “I hope that this regulation does not go beyond the border of the Pyrenees and get to Europe because it was completely useless for the readers, the publishers and for Google,” Escolar said. Members of the European Parliament have struck down two controversial amendments from a report on copyright reform – rules over the right to take photos of buildings and an EU “Google Tax”. The European Commission named the modernisation of copyright law as one of its priorities for the 16-point digital single market plans presented in May 2015. The Commission proposed a first copyright measure in December 2015 that would allow consumers to use digital content like Netflix when they travel within Europe, as long as they accessed it legally. EU Digital Commissioner announced that the executive will propose a further copyright reform measure in September or October 2016. The proposal was originally expected in spring 2016 but was delayed. One of the most controversial ideas floated by the Commission is the 'Google tax' or ancillary copyright law for online news publishers. National laws in Germany and Spain allowed media companies to charge online search engines to show their content in search results. What does Mr Juncker do with the sponsored trip to Google in the USA? Is this not a Lobbying Issue Mr Juncker? Answers in simple plain words please and no hedging around the issue.